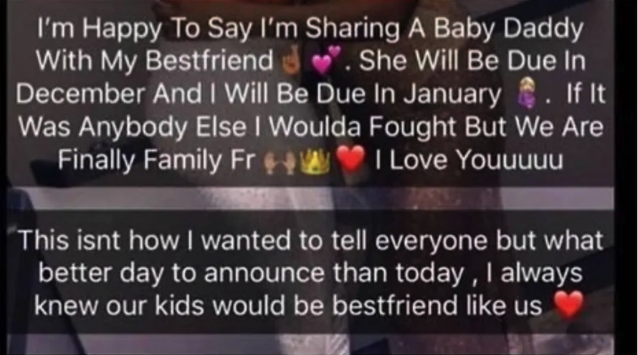 A young lady had taken to social media to express joy to be sharing her babydaddy with her best friend. The unidentified young lady shared a post on social media announcing the union of their family. According to the lady, she is pregnant for her babydaddy and her best friend is also expecting a child that is for babydaddy. The pretty lady who expressed that she is happy about the union shared a photo of herself and her best friend. In her post, the young lady stated that she would be due to give birth in January while her best friend would be due to give birth in December. The excited lady revealed that she can’t wait to meet their babies. She also noted that if it was someone else who got pregnant for her babydaddy she would have fought the person. She further added that she had always known that her kids would be best friends with her best friend’s kids. “I am happy to say i am sharing a baby daddy with my best friend. She will be due in December while i will be due in January. If it was anybody else, I would have fought but we are finally family fr, I love you. 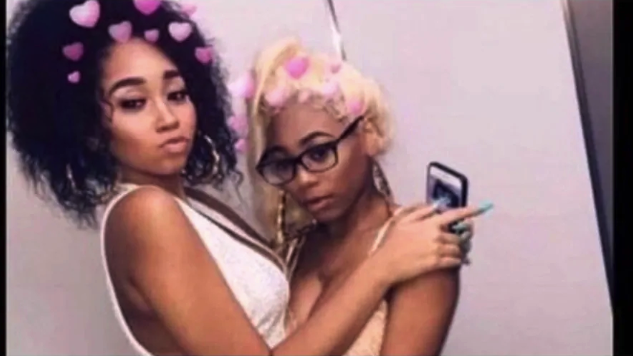 0 Response to "Lady Happy to Share her Babydaddy With Best Friend Says Their Kids Would be BFFs (Photos)"